How do I survive a long winter? Movies. Lots and lots of movies. In fact, my goal every January and February is to see as many of the Oscars Best Picture-nominated films as possible. And I always look forward to wrapping up movie season (and the near-end of winter) with a fun Oscars party. If you’re looking for an excuse to throw an Academy Awards party, this is it. I have teamed up with 9 other bloggers to bring you 10 movie-themed, party-ready recipes. Fences is based on a play by August Wilson. It’s about a Pittsburgh trash collector named Troy (played by Denzel Washington) and his relationships with his wife, son and family members. Several times throughout the movie, she made food for her family and visitors. She made chicken twice. I wanted to create an appetizer inspired by some of the foods she served. Chicken and waffles came to mind. Each bite has crunch, sweet, sour, and spicy. Although I recommend making the chicken yourself (it was my first time making buttermilk fried chicken and it wasn’t as difficult as I anticipated), you can buy ready-made chicken tenders and cut them into bite-sized pieces. I’m all about shortcuts when you’re throwing a party! 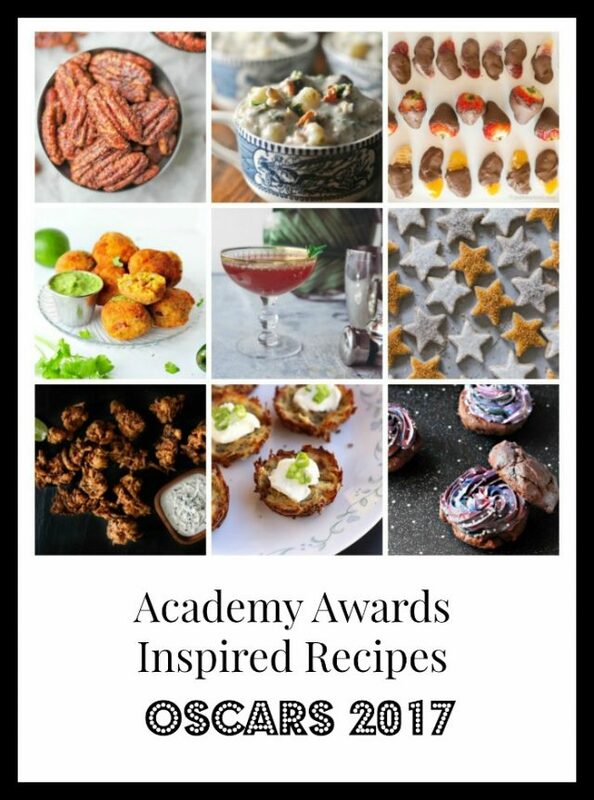 Get some super creative Academy Awards party ideas from Minnemama Adventures. Short on time? Want the super simple version of this recipe? Purchase fried chicken strips instead of making them from scratch. Marinade chicken: Cut each chicken breast in half the long way, and cut each half into approximately 9 pieces. You want chicken nugget-size pieces of chicken. Combine chicken pieces with buttermilk and spices, and place in a zip-lock bag. Marinade in the refrigerator for at least 2 hours, but preferably overnight. Fry chicken: Remove chicken pieces from buttermilk marinade. In one bowl, beat egg and buttermilk; add half the spices. In another bowl, combine flour with the remaining spices. Heat oil over high heat. You'll know that the chicken is ready to fry when it sizzles when dipped in the oil. Take one piece of chicken, dip it in the egg mixture, and then dip it in the flour mixture. Place chicken into the hot oil and fry for about 2 minutes, until the internal temperature reaches 165 degrees. Fry 4 or 5 pieces of chicken at the same time. Repeat until all the chicken is fried. Place fried chicken on a paper towel-lined baking sheet. If you aren't immediately assembling the waffle bites, keep chicken warm in a 300-degree oven. Assemble waffle bites: Toast mini waffles according to package directions. Drizzle a small amount of maple syrup on waffles. Top each waffle with a piece of fried chicken. Drizzle with sriracha mayonnaise. Top with a pickle and serve. Yum! I’ve never had chicken & waffles, but I think it’s something I should remedy ASAP! These look super tasty and I love the kick of heat with the spicy mayo. I haven’t seen this movie but I know Viola Davis is a shoe in for best Actress. I saw a clip where she’s so into her character’s emotions that there’s snot flying everywhere! Committed. 😉 Thanks again for organizing the party Haley! She really was great – and that is true about the snot flying everywhere! She stole the show, I have to say. Drooling over this amazing combination of flavors and textures. I think I may need to practice making these a few times before the Oscars ceremony! Wow this recipe is screaming to me to make it. The flavours you use are making my mouth water right now haha! Maple syrup, sriracha mayo, pickles and crispy chicken and waffles! Thanks for inviting me to this party Haley I had a fantastic time with it! Thanks, Joyce! So glad you were up for it 🙂 Come back, please, next year! Amazing suggestions. Thank you. The couple recipes I plan on using will spark my guests attention, I know. I may never make it to the Academy Awards, but as long as I can have these delicious little guys I’ll call it a win. I cannot get over how good these look! I’m sure I’ll never go either – but I’m with you. A great app is all I need to be happy during an Oscars party! I LOVE chicken and waffles! I often choose it off a brunch menu over anything else. The idea of a mini version served as an appetizer is amazing and the flavors in your recipe sound just perfect, especially the addition of sriracha mayo! These look amazing! I wish I’d found them last week when my son was looking for a chicken and waffles recipe for our Super Bowl party. I’m sure he’ll still be excited about trying this!